Except for poisonous spiders, such as the black widow and the brown recluse, spiders are not harmful to humans. When it’s important to eliminate spiders, chemical control is used, along with destruction of webs and eggs. Since they feed on insects, measures that eliminate unwanted insects will also reduce spider populations. Bees, wasps, and scorpions are dangerous because of their painful and potentially harmful stings. Fleas and ticks can carry potential disease and bloodthirsty bedbugs leave an irritating bite. 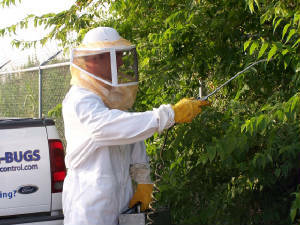 Our professionals with protective gear can remove Wasp nests and beehives. Insecticides are also used. Scorpion problems are usually treated chemically.